Incubators are used in the innovation science and industry to specifically generate inventions or to systemize the invention process. Incubators (breeding places) are craft rooms and laboratories just as organizational mergers, in which different work groups, different work styles, and formal and informal work processes are connected in an open and dynamic way. Up to a certain degree they are supposed to permanently organize and re-organize themselves in order to adapt flexibly to natural innovation processes. The idea to use incubators as a tool for systemization of the innovation process goes back to T. A. Edison and his Menlo Park Laboratory in New Jersey. Incubators are maintained by numerous companies as a fundamental part of their research and development departments nowadays. While in the projects iP1 und iP2 the planning has priority, in the Incubator module functioning demonstrators or experimental superstructures are implemented. The scale of the implementation is task-related. The seminar imparts basics of the systematic development of demonstrators. Furthermore, basics of the use and integration of micro system technology components, sensors, actuators, engines, and even robots (as integrated technology) are imparted. Advisors and our workshop-technician lend the participants their support concerning the realization of given or personal projects. 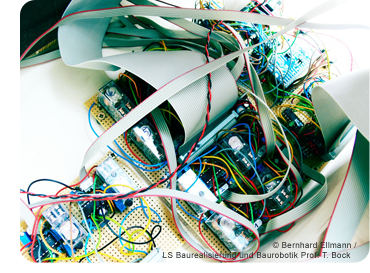 The Incubator module may relate to the projects from iP1 und iP2.